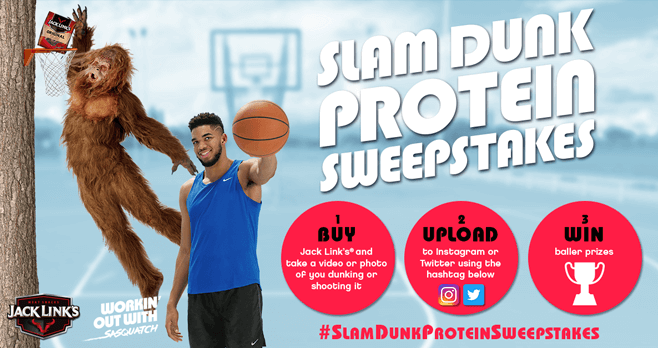 The Jack Link’s Slam Dunk Protein Sweepstakes is on! Now, you can show off your protein dunking skills for a chance to win baller prizes like a trip to a Big Pro Basketball Finals Game, a custom Sasquatch Pop-A-Shot, Jack Link’s Jerky for a year, or signed Karl-Antony Towns basketballs. Wondering how to participate? Here’s how to enter. Buy Jack Link’s and take a photo or record a 30-second video of you dunking or shooting it. Then, upload it online at www.jacklinks.com/slamdunkprotein. You may also post to Instagram or Twitter using #slamdunkproteinsweepstakes. Almost anyone can do it so go do it now! Eligibility: The Jack Link’s Slam Dunk Protein Sweepstakes is offered only to legal residents of the 50 United States and the District of Columbia, who are the legal age of majority or older in their state of residence (age 21 in MS; age 19 in AL/NE and age 18 in all other states/D.C.). Sweepstakes Period: Starts on or about 9:00:01 a.m. ET on Thursday, February 16, 2017 and ends at 11:59:59 p.m. ET on Wednesday, April 12, 2017. Limit: Limit 5 unique entries per person, regardless of the method of entry. Random Drawing: On or about Thursday, April 13, 2017, the Administrator will conduct a random drawing to select potential winners from among all eligible entries received. First Prize (5): POP-A-SHOT Premiere Basketball Game plus a one (1) year supply of Jack Link’s product. Second Prize (5): One (1) year supply of Jack Link’s product. Third Prize (30): Autographed Karl-Anthony Towns Basketball. Total ARV of All Prizes: $23,410. Winner’s List: For a list of Prize winners of prizes with a value over $25, send a self-addressed stamped envelope for receipt by 4/30/17 to: Jack Link’s Slam Dunk Protein Sweepstakes Winners, PO Box 2312, Framingham, MA 01703-2312. Sponsor: Link Snacks, Inc., Minong, Wisconsin 54859. Administrator: COHEN-FRIEDBERG ASSOCIATES, LLC Framingham, MA 01702. For complete details, including Official Rules, visit jacklinks.com/slamdunkprotein.